Champagne There are 6 products. 15 x 15 cm. Tiles. Hand Painted. 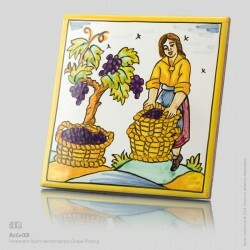 Woman collecting grapes. 15 x 15 cm. Tiles. Hand Painted. 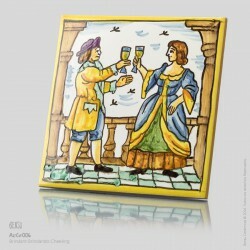 The man collecting grapes and the woman help him. 15 x 15 cm. Tiles. Hand Painted. 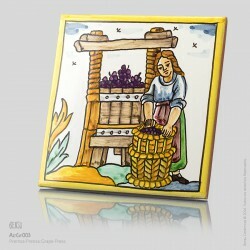 The woman filling the press with grapes. 15 x 15 cm. Tiles. Hand Painted. 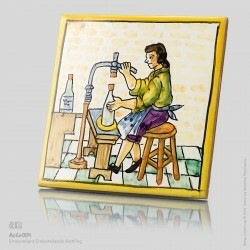 Filling up the bottle with cava and attaching the cork. 15 x 15 cm. Tiles. Hand Painted. 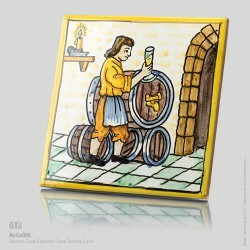 Tasting the cava kept in the barrel. 15 x 15 cm. Tiles. Hand Painted. Two people cheering with cava.